UZI is renowned in the industry and trusted by the military worldwide for their firearms. They continue their tradition of innovation by crafting impressive products tailored to the demands of law enforcement. Surveillance is critical to special operations and UZI's observation device is the optimal tool to carryout the job. The powerful antennae overhears and records conversations within a 300' range. Noise reduction combined with the frequency controller feature reduces background audio, improving the overall clarity of your recording. 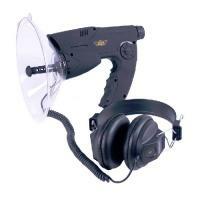 UZI's surveillance gear is equipped with an 8x monocular, microphone and headphone. Dimensions (Length x Width x Height): 10.5" x 8.25" x 8"